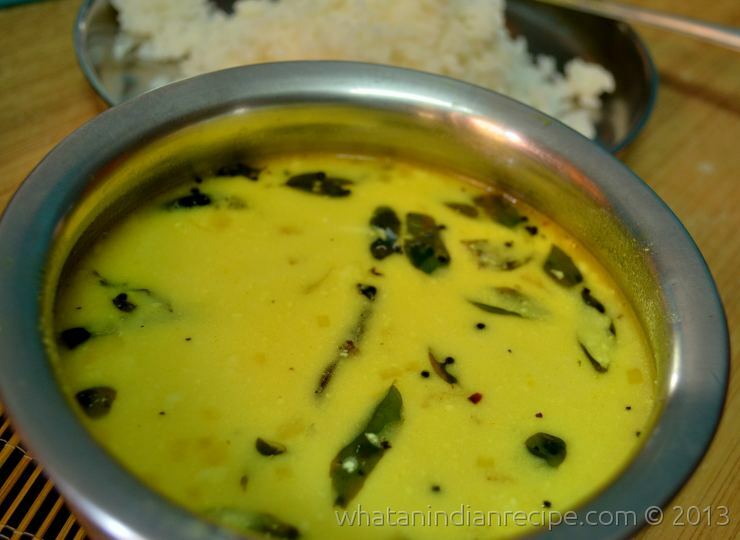 Buttermilk is prepared by adding water to curd and beating it, generally ¼ th part water it added to the curd, but you can modify it to your needs of thickness. Heat oil in a pan and add mustard and fenugreek seeds and allow it to splutter. to this add the curry leaves, green chillies , dry red chillies, onion and ginger and fry for 2 minutes. Meanwhile mix turmeric powder and salt to the butter milk and mix well. Now add the buttermilk to the seasoning and stir continuously for about 8 minutes. Make sure the buttermilk is at room temperature, do not bring it to boil and you should continuously stir or else it will curdle. Remove from fire and serve with steamed rice.